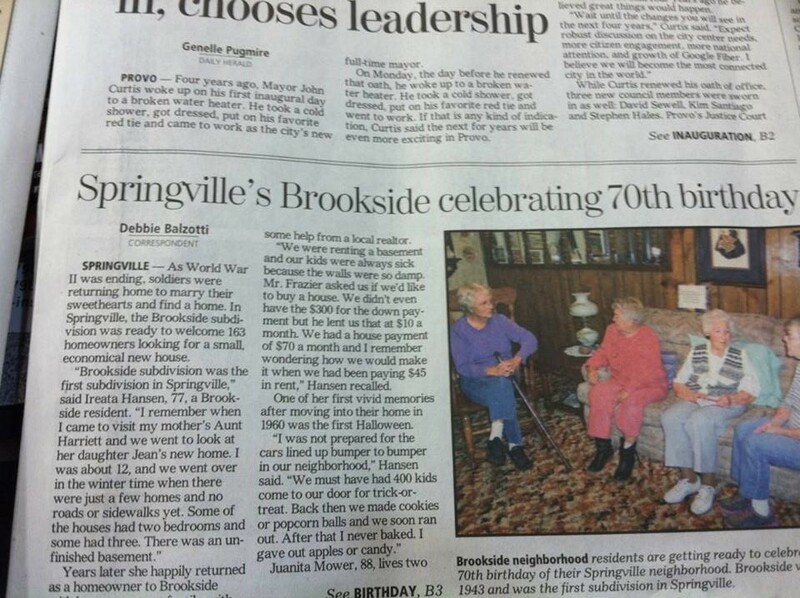 Living in Brookside myself, it was cool to see this article about the history of it. I’ve been talking to a lot of the old timers myself as well lately. As World War II was ending, soldiers were returning home to marry their sweethearts and find a home. In Springville, the Brookside subdivision was ready to welcome 163 homeowners looking for a small, economical new house. Years later, she happily returned as a homeowner to Brookside with her own young family with some help from a local realtor. “We were renting a basement and our kids were always sick because the walls were so damp. Mr. Frazier asked us if we’d like to buy a house. We didn’t even have the $300 for the down payment, but he lent us that at $10 a month. We had a house payment of $70 a month and I remember wondering how we would make it when we had been paying $45 in rent,” Hansen recalled. One of her first vivid memories after moving into their home in 1960 was the first Halloween. Juanita Mower, 88, lives two doors down from the Hansen family. She was born in Springville in 1925 and met her husband Eugene after WWII. Della Wood, 92, moved into Brookside in March of 1950. She and her husband paid $7,900 for their home. She mentioned that the houses hadn’t been selling well in Brookside in the early years until the Strong family built homes for all of their children and soldiers came home looking for affordable housing. Utah’s first lady, Jeanette Snelson Herbert, grew up in Brookside subdivision. Her mother, Bonnie Snelson, still lives in the family home purchased in 1956 for $8,700. The Snelsons came to Springville looking for a home when Herbert’s father became the manager of the local JC Penney store. Bonnie Snelson smiled as she remembered how an uncle who was a realtor discouraged them from buying a house in Brookside. The Snelson family, like most of the families in Brookside, remodeled and expanded their homes as the years went by. Homeowners added garages, built fences and made improvements as the decades passed.